USS Princeton started out life as the USS Valley Forge. However, with the loss of CVL-23 USS Princeton in November 1944, the ship received her new name. The ship was commissioned on Nov. 18, 1945. After making its first deployment to the Atlantic, in June 1946, she transferred to the Pacific Fleet. There she joined the 7th Fleet, becoming the flag ship (TF 77). During her Pacific time, she cruised off of Japan and China. In February 1947, she went back to the US and served out of San Diego until she was decommissioned in June of 1949. Princeton came back into service in August 1950. In December of that year, she went west to support the Korean War efforts. In total, she made three trips to the combat zone. During this time, she supported thousands of missions. With the close of the Korean War, the ship returned to west coast duty. 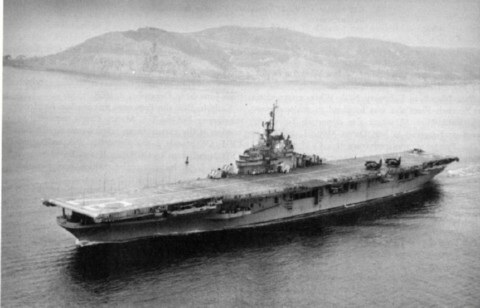 In January 1954, the ship was reclassified to CVS-37 for anti-submarine support status. In that role, she served in the Pacific and Indian Ocean for the next four years. In March 1959, she came out of a conversion to become an amphibious assault carrier with hull designation LPH-5. In October 1964, the ship once again entered combat operations. For the next four years, she served several voyages to support Vietnam forces. In April 1969, she acted as recovery ship for Apollo 10. In January of 1970, the ship was formally decommissioned. FEB 1958 - FEB 1958 Flood relief to Ceylon (now Sri Lanka) and crossed the equater .